Pressing & Delivery in 5 to 6 weeks.  We offer a complete service of vinyl records pressing for independents. In direct relation with the manufacturer, we are specialized on orders from 100 to 1000 copies. First step of the production of a vinyl record. The audio signal is cut on a “lacquer”. Once this lacquer is cut, it goes for galvanic treatment, or plating. Second step of the process to make a vinyl record. The lacquer goes through a chemical and electrical treatment, wich permits to obtain the stampers. Last step of the process. After placing the stampers in the press, a heated pvc pallet is put in the press with the labels. A short cycle of heating and cooling will give an almost finished vinyl record. Printing of the sleeves, labels, inserts, are made by an eco responsible printer, working exclusively on offset machines. We guarantee the shipping of your orders in the fastest time period trough our carrier, including the tracking of your parcels in real time. Last step of the process. After placing the stampers in the press, a heated pvc pallet is put in the press with the labels. A short cycle of heating and cooling will give an almost finished vinyl record..